People and Language(s): the Central African Republic population is made up of more than 80 different ethnic groups, none of which represents a clear majority of the country. They include the Baya, Banda, Sara, Mandja, Mboum, M'baka. French and Sangho are the official languages. Religion(s): Christianity, Islam and indigenous beliefs are all practised. Membership of international groupings/organisations: Central African Economic and Monetary Union (CEMAC), Central Bank of Central African States (BEAC), Community of Sahel-Saharan States (CEN-SAD previously COMESSA), Organisation for African Unity (OAU), International Monetary Fund (IMF). Major trading partners: European union (especially France and Belgium), United States, Cameroon, China. Exchange rate: Euro 1=CFA 655.957 (fixed). While the majority of the population of CAR relies on subsistence farming or petty trading, the government relies on agricultural exports, diamonds, timber, cotton, and overseas aid. The country is also rich in other natural resources such as gold, and uranium but these are largely unexploited, as are unconfirmed quantities of oil in the northern part of the country. As the country is landlocked, transport costs are a problem for the export sector. The territory of present day CAR was called Oubangui-Chari in colonial times, named after the country's 2 largest rivers. It was 1 of 4 territories of French Equatorial African Empire, marking the point where French colonial advance to the east was halted. Colonial rule was based on a plantation economy, and the French were often brutal in their treatment of Africans. CAR was formed in 1958 as the French empire broke up, and became officially independent in 1960. The leader of the country in the 1950s, the priest Barthelemy Boganda, died in a plane crash in 1959. The young teacher David Dacko became President on independence, with strong French backing. Dacko's rule was corrupt and incompetent. He was overthrown in a coup in 1966 by Colonel Jean-Bedel Bokassa. If life under Dacko was bad, it was about to get much worse under Bokassa. His rule was utterly despotic, culminating in his decision to transform the country into an empire, with himself as emperor, in 1976. The ruinously expensive coronation ceremony, based on the coronation of Napoleon, became a symbol of the excesses of despotic power. His regime unravelled rapidly in 1979, as he lost the crucial support of the French following an incident in which protesting school children were killed. He was toppled in September in a bloodless coup, orchestrated by the French, who put David Dacko back in the Presidential hot seat. Dacko restored the republic following the imperial interregnum. However, he was duly overthrown again, by the General Andre Kolingba in 1981. Initially the head of a military junta, Kolingba gradually incorporated civilians into his government. In 1986, he formed a political party, the RDC, and he became constitutional president in November 1986. CAR has good, if low-level and uneventful, relations with 2 of its direct neighbours - Cameroon and Congo-Brazzaville. CAR is a founding member of the French backed regional organisation CEMAC (Cameroon, Congo-Brazzaville, Gabon, Chad and Equatorial Guinea are the other members), which deployed peacekeeping troops to CAR in 2003. These troops are still in country. 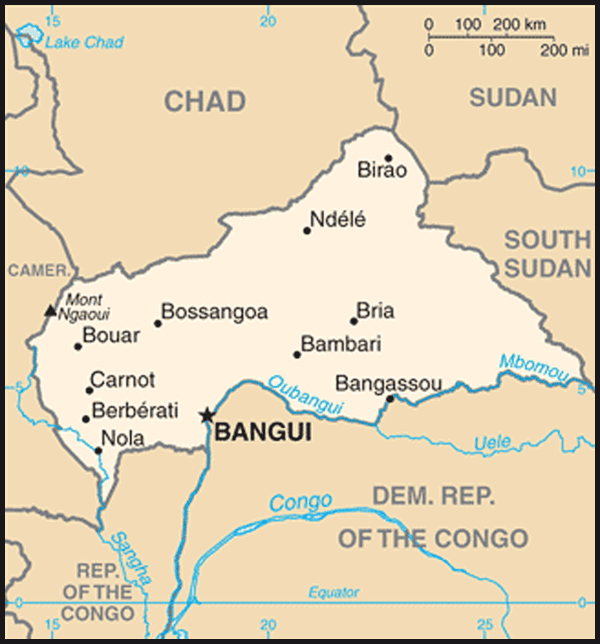 Relations with Chad and the Democratic Republic of Congo have however been marked historically by disputes over border incursions and the sheltering of dissidents and rebels. Patasse was supported by the Congolese armed group the MLC, who were accused of violence and criminality while in the country. President Bozize has recently made efforts to improve relations with the government of DRC, with the eventual aim of re-opening the border, which has been officially closed since 2002. Relations with Chad were tense while Patasse was in power, but they have improved markedly since Bozize took over, and Chadian troops have been deployed to protect the new regime. President Bozize has developed relations with South Africa, who have deployed an army contingent to help presidential security. He has maintained cordial relations with Libya. The CAR has traditionally looked to its former colonial power for support in terms of aid, military presence and in negotiations with other donors. The French withdrew their military base in CAR in 1997, as part of an overall reassessment of their military presence in Africa. They have deployed troops to support Bozize’s government, by providing training and logisitical support to the CEMAC peacekeeping force. They currently have several hundred troops in the country. In 2008 a United Nations Mission in the Central African Republic and Chad (MINURCAT) and a European Union peacekeeping force (EUFOR) Chad/CAR were deployed in Chad and north-eastern CAR (around Birao) to contribute to the protection of vulnerable civilian populations and to facilitate the provision of humanitarian assistance. In January 2009, the UN Security Council authorised the deployment of a military component to MINURCAT. This force took over from EUFOR at the end of its mandate on 15 March 2009. However MINURCAT in CAR are due to withdraw December 2010. The then Prime Minister Ziguele visited the UK in early September 2002 to deliver a keynote speech at Wilton Park. This was the highest level visit ever to the UK from CAR. HRH Duke of Edinburgh visited CAR in March 1999 as part of a working visit to the region in his capacity as President Emeritus of the Worldwide Fund for Nature. The British Embassy in Yaounde, Cameroon, is normally accredited to CAR on a non-residential basis. The British High Commissioner there, Bharat Joshi and has presented his credentials as Ambassador. CAR's Ambassador in Paris, Jean Willybiro Sako, is accredited to the UK. 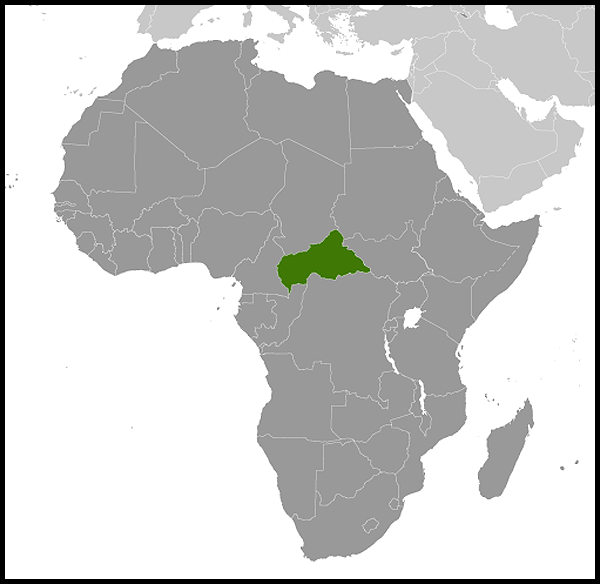 Central African Republic (CAR) is landlocked. It is mainly savannah in the north and equatorial forest in the south. Chad borders the north of the country, with Sudan to the east, Democratic Republic of Congo and Republic of Congo are on the southern border. Cameroon lies to the west. The Oubangui river, which forms the southern border and flows through the capital Bangui and then south to the Congo basin, is an important transport route. UK exports in goods to CAR were worth £0.829 million in 2008, up from £0.586 million the previous year. CAR's exports in goods to the UK over the same period were worth £68,998, up from £1,415 the previous year. CAR is desperately poor. 62% of the population live on less than $1.25 a day, and life expectancy at birth is 43 years, putting the country near the bottom of the UNDP Human Development Index (178 out of 179 countries measured). The country is highly dependent on funds from donors. France has always been the biggest bilateral donor. Relations with all donors were very poor in the later years of the Patasse regime and there was a significant build up of unpaid arrears on donor loans. Relations have improved more recently, and in early 2006 the country signed its second IMF Emergency Post Conflict Assistance Loan. This was transformed into a Poverty Reduction and Growth Facility loan in December 2006. The government’s Poverty Reduction and Growth Strategy was presented to donors at a round table meeting in Brussels at the end of October 2007. This round table was successful, with donors pledging $600m. CAR reached completion point of the Highly Indebted Poor Countries Initiative at the end of June 2009. Despite this relatively optimistic macro economic outlook, the instability in the north has had disastrous consequences for the local populations. According to UN agencies, 212,000 have become displaced within the country, and a further 80,000 have fled to neighbouring countries, some of which are themselves unstable. As in other African countries, at the beginning of the 1990s a combination of international and domestic pressure forced President Kolingba to open up the political system and allow for multipartism. The constitution was re-written allowing for a presidential system, with an elected National Assembly. Presidential elections took place in 1993. The opposition leader Ange Felix Patasse won a 6-year term. Patasse’s government lurched from one financial crisis to the next his rule was shaken by a series of army mutinies over pay arrears and a series of national strikes. The French initially intervened to support Patasse in 1996, followed by an African peacekeeping force (MISAB). In 1998, a United Nations force (MINURA), deployed to the country as the French pulled out their troops. MINURA departed the country in 2000 and was replaced by a UN office. Patasse was re-elected in presidential elections in 1999, which were remarkably peaceful given the country's problems, and sworn in for a new term of office in October of that year. In March 2003, Patasse's government, again weakened by mutinies and financial crisis, was overthrown by the renegade former chief of Staff General Bozize. Despite continuing problems of lawlessness and banditry throughout the country, Bozize managed to retain control of the state while preparations were made for elections in 2005. Despite having stated on taking power that he would not run for the presidency, Bozize swapped his uniform for civilian attire and did just that. Former Prime Minister Martin Ziguele took Bozize into a second round in May 2005, which Bozize won with 64.6% of the vote. The elections were generally considered free and fair on the day. Bozize's newly founded political movement (Convergence Kwa Na Kwa) won 42 of the 105 parliamentary seats in the concurrent legislative elections. He has since formed a government, but his parliamentary majority is unstable. 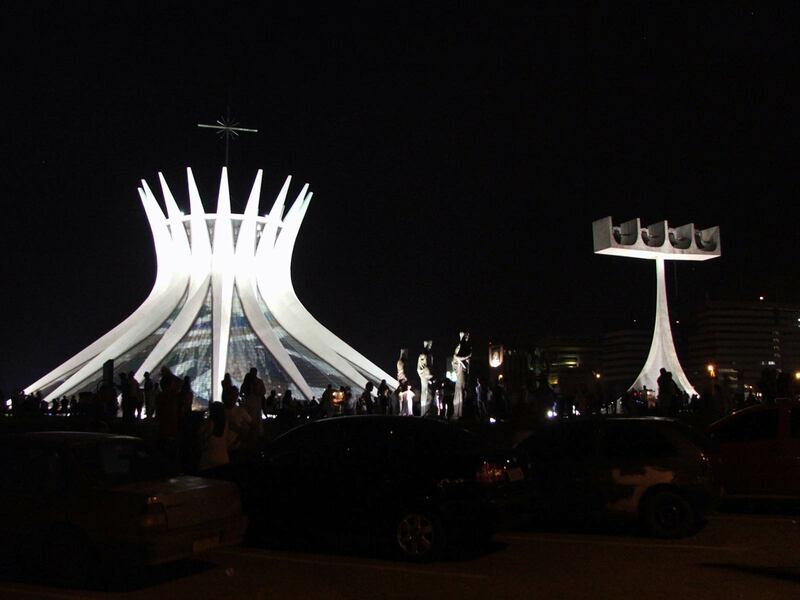 CAR remains very unstable and government authority is minimal outside the capital. Faustin Archange Touadéra was appointed has the new Prime Minister in January 2008. In December 2008 an Inclusive Political Dialogue between the government and rebels and political opposition was held and a measure to form a government of national unity was adopted. In January 2009 President Bozize formed a new government. Two rebel groups, the APRD [People's Army for Restoration of Democracy] and UFDR [Union of Democratic Forces for Rally] entered into the new government. However sporadic clashes between government forces and rebels have continued in 2009. The next round of elections is due to take place in 2010. The history of CAR is unfortunately replete with abuses of Human Rights. Bokassa was the most notorious culprit. Thousands died in his prisons. Of more current concern are abuses committed by the security forces, which are rarely under the full control of State authorities, and benefit from almost total impunity for their actions. There are many credible reports of putchists committing human rights abuses against the population of Bangui in the aftermath of the coup in 2003, and of soldiers and rebels in the north of the country pillaging the local populations (according to Amnesty International reports, among others). In February 2007 Human Rights Watch reported on abuses by the Presidential Guard in its fight against insurgents in the north of the country. Bozize reacted to this by opening dialogue with HRW, and stated his intention to put a stop to these abuses. Most of the elite Presidential Guard forces were withdrawn from the region. However the security situation still remains volatile as bandits have become a threat to the population. On 7 January 2005, the government referred the situation regarding violence in the country in 2002 and 2003 to the ICC. On 24 May 2008, Jean-Pierre Bemba Gombo, President and Commander in Chief of the Mouvement de libération du Congo (MLC), was arrested by the Belgian authorities following a warrant of arrest issued under seal by the International Criminal Court. On 3 July 2008, the Belgian authorities surrendered and transferred Mr Jean-Pierre Bemba Gombo, to the International Criminal Court. From 12 to 15 January 2009, a confirmation of charges hearing was held. The ICC Pre-Trial Chamber II decided on 15 June 2009 that Bemba would face trial. As military commander, Mr. Bemba is allegedly responsible of two counts of crimes against humanity and three counts of war crimes.